Negotiations to stop another government shutdown have stalled, as lawmakers remain at an impasse over border security. If an agreement on funding the government isn't reached by Friday at midnight, the government could partially shut down again, just three weeks after the longest U.S. government shutdown in history. 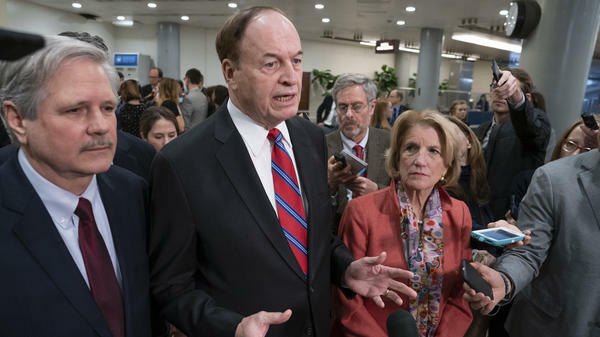 Republican Sen. Richard Shelby, Chair of the Senate Appropriations Committee told Fox News Sunday he put the odds of a deal at 50-50. "I think the next 24 hours are crucial. We could close some deals, but they've got to be good, to secure our borders," Shelby said. President Trump has asked for $5.7 billion to fund a wall along the U.S. border with Mexico. On Sunday Trump tweeted that Democrats "are offering very little money for the desperately needed Border Wall & now, out of the blue, want a cap on convicted violent felons to be held in detention!" According to The New York Times, "While Democrats refused to entertain the prospect of fulfilling Mr. Trump's $5.7 billion demand for a border wall, lawmakers had grown closer to accepting a number between $1.3 billion and $2 billion for physical barriers. But they also demanded the limit on ICE beds, as a way to force the agency to focus on detaining migrants with criminal records instead of people who have overstayed their visas." Politico reports, "Lawmakers are discussing the possibility of a year-long continuing resolution bill but so far discussions have not led to a proposal that both House Democrats and Senate Republicans could get on board with." Acting White House Chief of Staff Mick Mulvaney told NBC's Meet the Press that negotiations are "all over the map because of the Democrats" and that "the White House, at the request of all the parties on the Hill, have sort of stepped back. We're still participating, we're still listening, we're still talking, but we're not leading the negotiations." When asked about funding for a border wall, Mulvaney said he "absolutely cannot" rule out another government shutdown. He added the "most likely outcome" is that Congress will reach a border security agreement Trump will sign.